I’ve had four attempts so far, each better than the last, so I’m trying to capture what’s working and what isn’t. Attempt 1 failed to rise at all. It was tasty, but very dense. 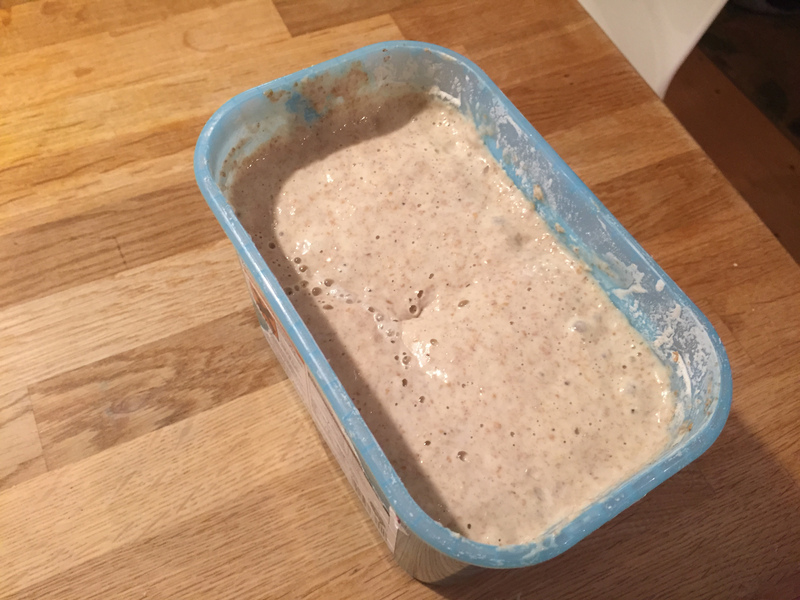 I threw away the starter and started again. It’s winter in the UK, so the house gets quite cold overnight – and well-lagged hot water cylinders means that the airing cupboard isn’t really an option to keep the starter warm. But I made a paste of 100g strong white flour and 100g water, and left it in a covered tub on the radiator. 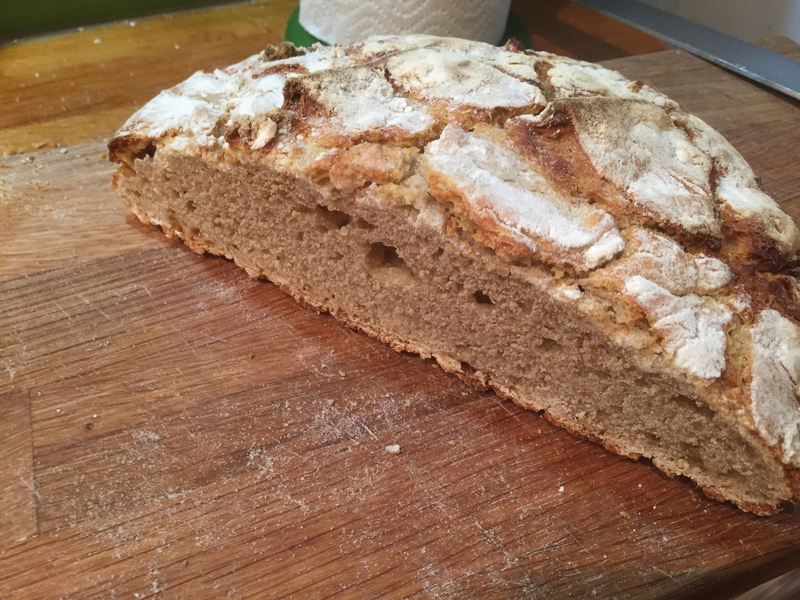 The next day, I stirred in 100g wholegrain flour, 100g water, and then repeated this for another couple of days until the starter smelled like yoghurt and was starting to look bubbly. Attempt 2 was more successful. I followed this recipe, but over-proofed. 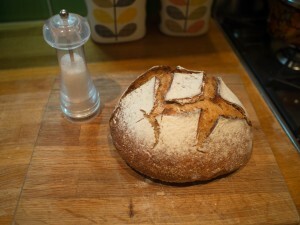 The dough got stuck to the inside of the bowl and by the time it was baked, I’d knocked most of the rise out of it. I shared this on Facebook and a couple of friends, Keely and Mat, made suggestions. Keely recommended proofing slowly, in the fridge, which I did. 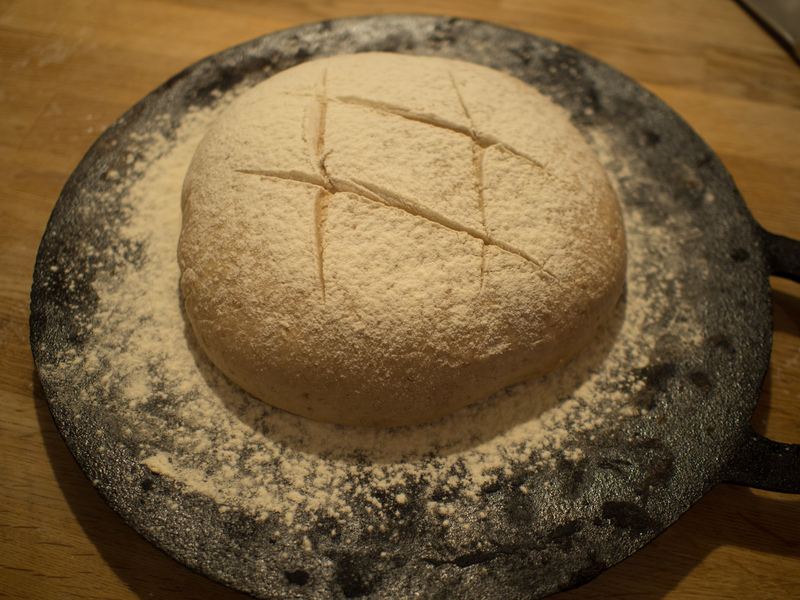 The dough seemed much more manageable but I think I over-kneaded it and under-baked it. 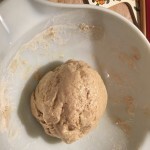 So attempt 3 looked quite cool and it held its shape but it was as dense as a cricket ball – chewy raw dough in the middle, but again a good crust. 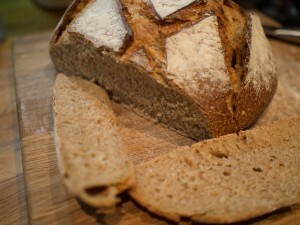 A crust develops well when there’s steam in the oven. 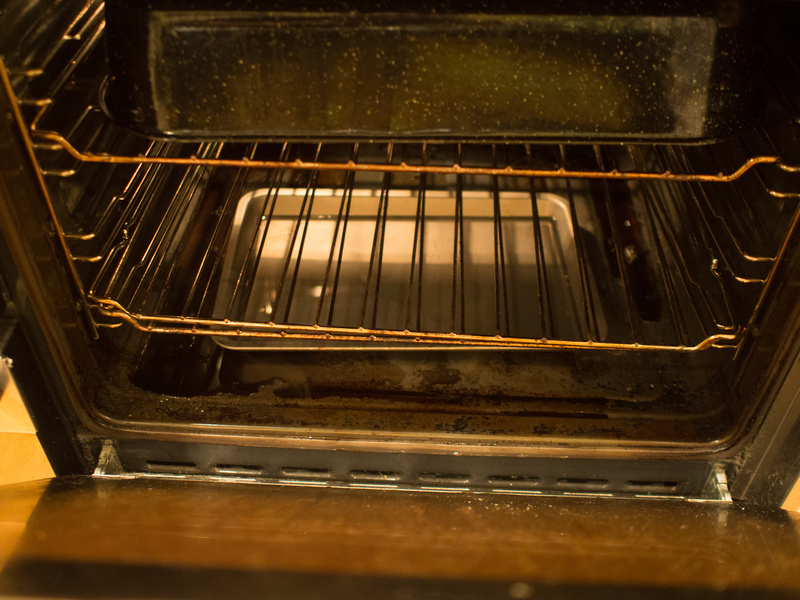 Create this by getting the oven really hot, throwing a mug of boiling water into the bottom of the oven and then putting an oven tray of boiling water on the bottom shelf. I might need to buy a dutch oven in the future but in the meantime an inverted roasting tin can act as a cloche to trap the steam. I now know what “dutch oven” is supposed to mean. 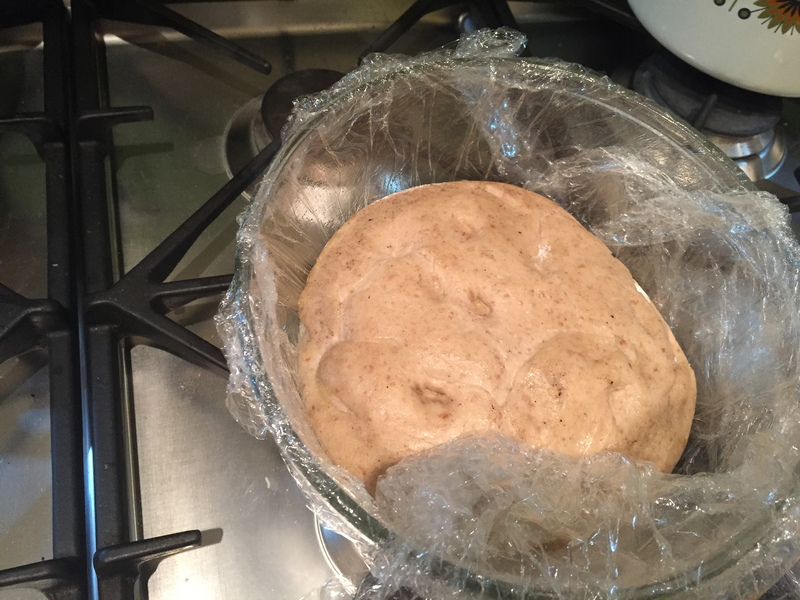 You can over-proof the final rise, and if your dough gets stuck to the bowl/proofing basket, you’re stuffed. You can under-cook – the “hollow tap test” isn’t very accurate. 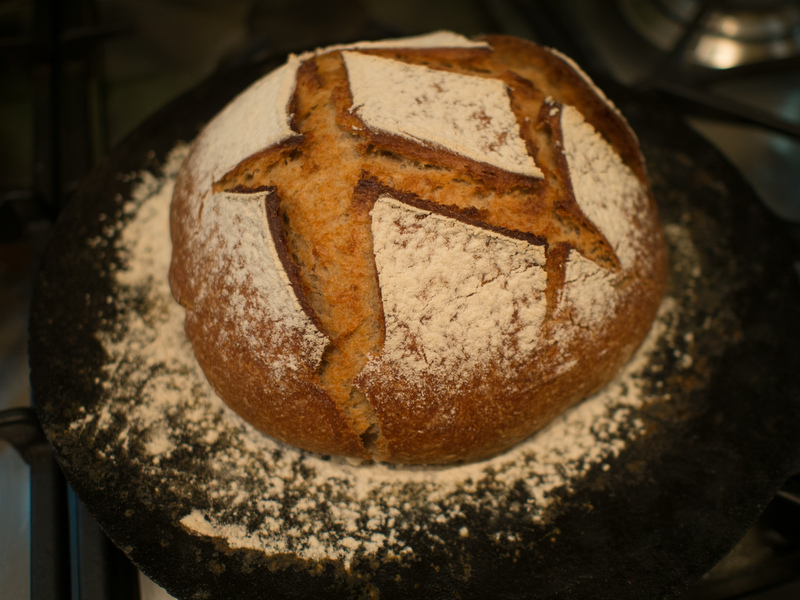 You can over-knead the dough. A long and slow first proof in the fridge makes the whole process much more manageable. 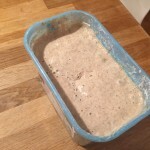 The starter needs to be furiously bubbling at the start to give you any chance of success. 1. Take the sourdough starter out of the fridge. If there’s a thin pool of liquid on top, tip it away. Stir in 100g strong plain flour and 100g water to make a porridgey blend. 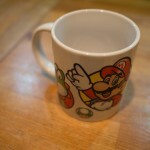 Put this on the radiator, stirring once in a while, until it starts bubbling like mad. 2. 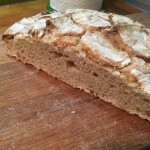 Weigh out 300g of starter, 400g of strong plain flour, 220g water, 10g salt. Roughly mix these together in a mixing bowl to produce quite a stiff dough. Smear this with olive oil and leave in the fridge overnight. 3. Dust your work area with flour, pull the dough into a rectangle roughly 40cmx30cm. Fold the long side into thirds and the short side in half. Repeat this folding cycle around ten times. 4. 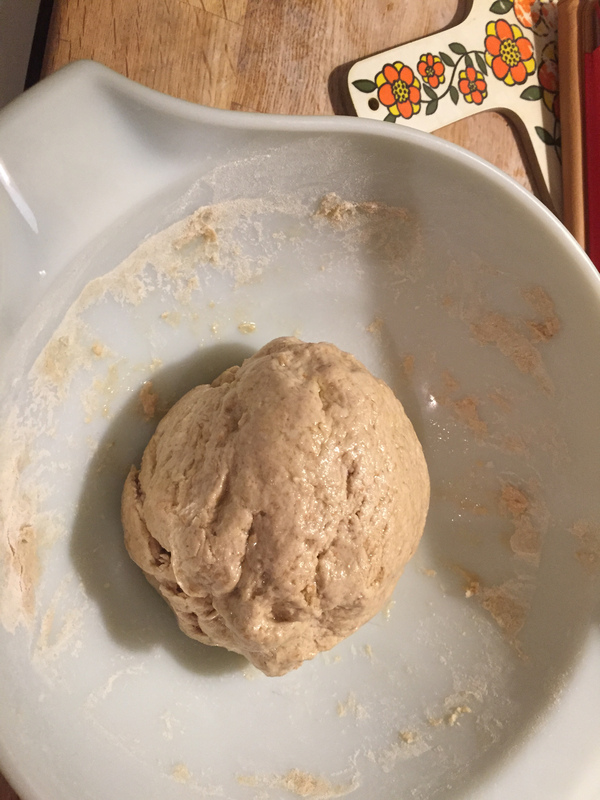 Line a bowl with oiled cling film and place the ball of dough seam-side down, inside. Leave it in a warm place for a couple of hours until it’s doubled in size and passes the poke test. 5. Get the oven up to maximum temperature. Switch off the fan. Invert a roasting tin on the top shelf to try to contain some of the steam, and put another tin of boiling water on the bottom of the oven. 6. 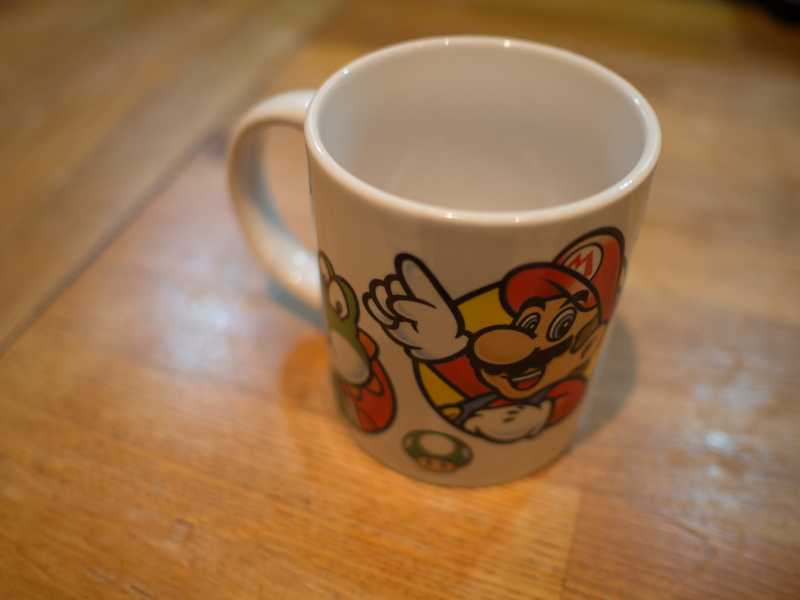 Splash a Magic Mario Mug of boiling water on the inside of the oven to generate even more steam. Leave the oven ten minutes to get back up to temperature. 7. Tip the dough onto a floured pizza stone. 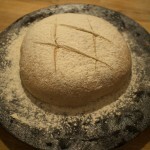 Dust the top with more flour, and then score a pattern into the top with a sharp knife, to allow the crust to fracture in a controlled way as the loaf expands in the oven. 8. 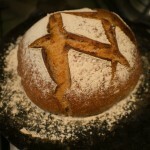 Bake for 25 mins at max temperature. Attempt to look through the oven door using the LED torch on your phone. Fail. Cross your fingers and hope. After the 25 mins is over, open the door and have a peek. 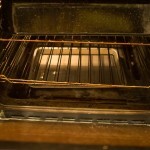 Turn the oven down to around 190degC, turn on the fan and give it another 20 mins or so. Take it out when the crust looks brown and tapping the bottom produces a hollow sound. Dough didn’t stick. Didn’t lose air when tipping out. Undercooked. 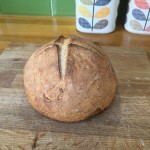 Need a better method than the tap test to know when it’s cooked (or need to do the test properly). 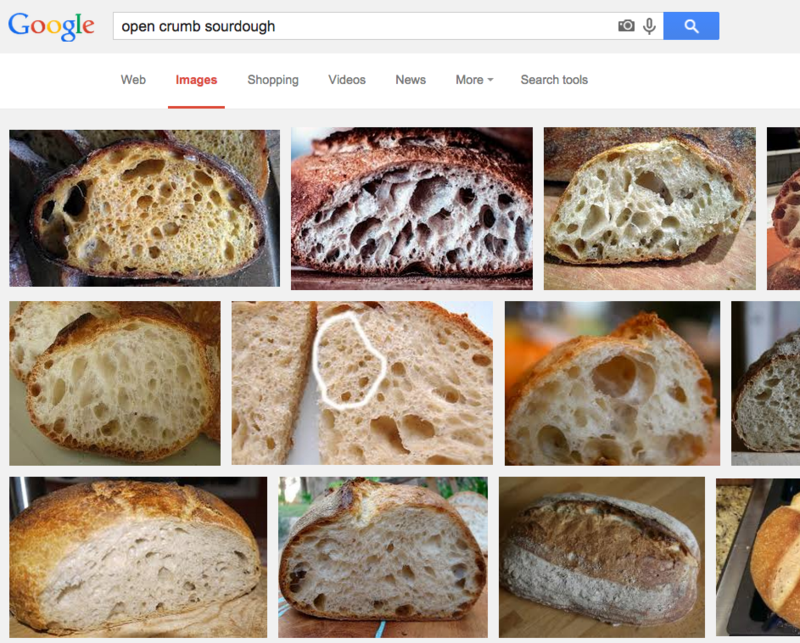 Crumb is still too small. Fewer folds next time. Bubbles are way too small and too few. Need a wetter dough, and a different approach to handling it. 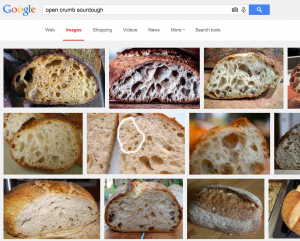 Crust is maybe too thick? Accept and monitor. 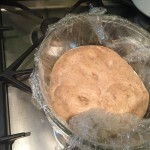 Investigate: rattan proofing basket, wheatgerm lining, rye flour. What else do I need to be thinking about?